I always enjoy the bay in the early morning. When the tide is out the sand flats and puddles take on the colors of the sky. Early morning can also be a good time to find some birds that are difficult to see later in the day. I have been out with other birders when they have called out... "Varied Sittella" ... but I have never had more than a brief glimpse of an LBJ ('little brown job') high in the trees and moving so fast it was impossible to properly ID it. This morning, however, there was a group of these birds sitting high in the trees - but sitting still and enjoying the early sunlight. 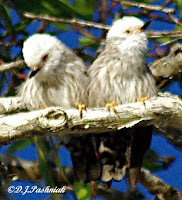 Two of the birds were sitting close on a branch and preening each other. Varied Sittella (Daphoenositta chrysoptera) are tiny - only 10-12cm. 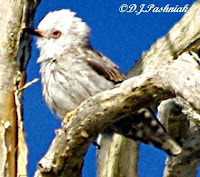 The ones I saw were the white-headed form that occurs in SE Queensland and E. New South Wales. 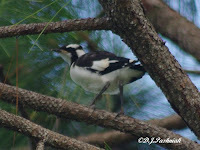 It has been very interesting watching the Magpie-larks (Pee-wees) that have nested in the big pine tree next to my house. The nest was too high and far away for me to get really good looks at the young but it was obvious that there was often one bird pushing up above the others. This bigger and 'pushier' bird then took to standing on the side of the nest rather than being cramped in with the others. My experience with watching nesting birds is not large! 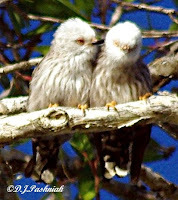 I had Noisy Miners nesting close to my house down in NSW and I watched them raise several lots of young. When the young fledged they flew after the parents immediately. Sometimes there was one that was a little slower and it fluttered into a low branch of a near-by tree for a while. These Pee-wees have been quite different. 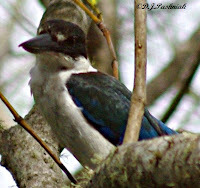 Last Thursday the larger one got out of the nest and stood on the branch close-by for the rest of the day. It teeter-tottered and did not look at all steady. The next day it got itself up higher into the tree by carefully moving along near-by branches. There are so many small branches so close to each other that it was not hard to find places to climb. Over the next couple of days the other three young ones all left the nest and teetered higher into the tree. It was as if the parents had provided a climbing gym right at their door! At first they only used their wings for balancing as they moved along but then they began fluttering from branch to branch. Yesterday afternoon three of the young ones followed the parent birds down onto my lawn. They all had a go at finding things to eat among the grass but it was obviously easier to demand food from the parents. The young ones were even less steady standing on the ground. Maybe they found it difficult after the tree branches which had been swaying in the strong wind. One young bird kept calling from up in the tree and the parents flew back to feed it there. The first photo is of a young bird and the next photo is of two young ones following the adult. 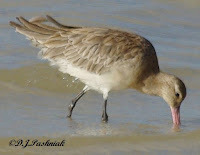 The beaks are different colors in the juveniles and adults. There was a near disaster when one young one flew into the side of my house and then couldn't seem to find its way back out from under the veranda. My animals had ignored them until then but a young squawking bird clinging to the bricks and even perching on the dog's sleeping kennel was just too much! I grabbed the cat and locked her up and then held the dog while the little bird sat and thought about things for several moments before it found its way back to its parents. This morning some of the young ones are being fed up in the tree and a couple are chasing the parents around my yard. The cat is locked up and the dog is ignoring them. This video was taken this morning and you can hear the harsh hissy" noise the young ones make to attract the parents. This post is for anyone who has not yet started doing this with your photos. If you already know all about it - don't bother reading further! Wikipedia says that "geotagging is the process of adding geographical identification to ...media such as photographs..." I have read about geotagging for some time now but have only just started using it. Now I am adding the data to my photos I can't believe it's taken me this long to get going! There will certainly be benefits to having GPS data attached to all my photos. I will now have precise location data attached to the exif data on each photo and over time can build a much more precise picture of how different species use the roosting sites. I recently bought a Garmin etrex H handheld GPS unit. This is not a complicated unit but records tracks - which is the only thing I really need to geotag photos. Of course, the computer connection is also essential! The cables to connect to the computer are bought separately - and are very much more expensive here in Australia than they are if bought on-line. My thanks to Matt (Neil and Kel's son) who downloaded and showed me the program he has been using to download info from a GPS unit. He has been using EasyGPS which is free software. Plug in the GPS unit to the computer and use this program to download all the information from it. Then save the track file - this will save as a GPS Exchange File (.gpx). Matt also suggested that I try GPicSync which is a Free and Open Source Tool. This asks for two things - the folder where the photos are stored and the location of the .gpx file you have just saved. Then it synchronizes the two - and heh presto! All the photos in that folder now have GPS data written in the exif data! This is so much simpler than writing in data one photo at a time - which is what I was previously doing. Now a couple of things to be careful about. Make SURE that the camera time stamp and the GPS unit's time are syncronized! Also for eastern Australia I needed to put in a UTC offset of +10 in GPicSync. Exif GPS data is written as degrees minutes and seconds - not decimal degrees so check what your GPS has been set to show. Another spectacular sunrise this morning and the weather forecast is predicting showers and thunderstorms. Yesterday morning I went for an early morning walk along the foreshore at Mullens. The tide was well out and there was plenty of exposed sand. I met Peter whose ability to catch crabs I described here. He was with a friend and they both already had their fresh catch for breakfast safely tucked down in the buckets they were carrying. When I meet people like this I know how very little I really understand about this environment! This time they told me how many sandprints they had seen of flatheads. (Check this page for a description of the species.) 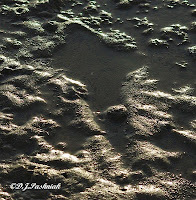 When I admitted total ignorance they showed me numerous prints left in the sand right around where we were standing. I had been walking right over them and not seeing them! Then they told me that Shovel-nose Sharks left a similar print but it was easy to spot the differences - and they soon found a print of one of these and showed me how the head of the shark is much longer than that of the flathead. The only birds I saw on my walk were too far away for me to get good photos. However, there was plenty going on in my own backyard. For several weeks I have been watching the Magpie-larks (commonly called Pee-wees) which have built a nest in the big pine tree nest door. The nest is looking pretty crowded right now! I counted 4 baby heads poking up all together! They were very active early in the day and jostled for the best position in the nest. 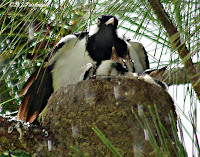 Later when it started to rain they were quite happy to settle down low as one of the parents came and perched on the edge of the nest and spread its wings to give as much shelter as possible. This morning the parents were busy stuffing food in hungry mouths as soon as it was light. Then a little later I saw one of the juveniles sitting up and preening its new feathers and stretching its little wings. I think they will soon fly and hope to get some photos then. Sunday morning was the highest tide for the year and we had planned to kayak around to the Mullens roost and get some photos - just as we did last year. However, when I went out at sunrise this is what the sky looked like - and a couple of hours later it was even worse! The weather was certainly not so bad that we couldn't have gone but the whole point of the day - for me anyway! - was to get some good photos and this was definitely not going to be possible with the dark conditions. We went out on a similar tide last year and the photos then were great. 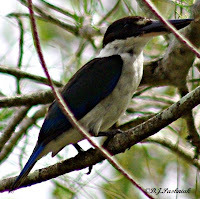 The highlight of the morning for me was to see a Collared Kingfisher! I have hoped to see this bird for a long time and have frequently tried to imaginatively turn a Forest Kingfisher into the one I was hoping for! The tide had made a shallow pool in under some casuarinas and there were two kingfishers diving down into the water to retrieve prey. We think we heard a third one but by the time we located the birds there were only two there. It turned out to be a very interesting morning even though we didn't get perfect weather to kayak out on a perfect tide. The Mullens shorebird roost is always beautiful on a big high tide. As I kayaked around into the bay the other morning I could see the larger shorebirds spread out along the edge of the bay. (All photos can be enlarged by clicking on them.) All of the bay is very shallow and at low tide there is no water and the saltmarsh vegetation is uncovered. 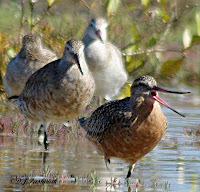 I knew that where I could see the larger birds roosting there was not enough water for me to get in close in the kayak so instead I let the tide drift me in to the head of the bay where I knew the smaller shorebirds would be roosting. When I ran aground I got out and walked slowly in behind a large flock of mixed Red-capped Plovers (Charadrius ruficapillus) and Red-necked Stints (Calidris ruficollis). These little birds can usually be found roosting together. 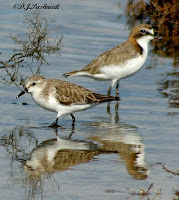 The Red-capped Plover is an Australian bird and stays here all year. It is approx. 15cm. and weighs 37gms. 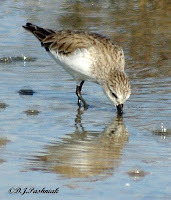 The Red-necked Stint is the smallest migratory shorebird that comes down to Australia. It breeds up in northern Siberia and Alaska. 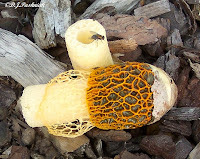 It is approximately the same size and weighs about 25gms. 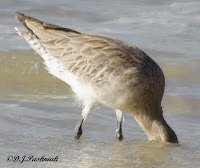 It looks smaller than the Red-capped Plover as it is usually hunched over a little. The little Red-capped Plover is always curious and will often walk closer to get a better look at you, while the Red-necked Stint simply gets on with the very important business of finding food. 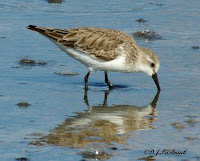 In the next photo the Red-capped Plover is on the right of the photo and the Red-necked Stint on the left. I walked closer very slowly and made no sudden movements. The birds let me get very close indeed without showing any signs of disturbance. 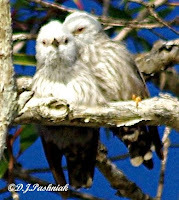 You can tell that they are not disturbed when your photos show most birds with their eyes closed or half closed!